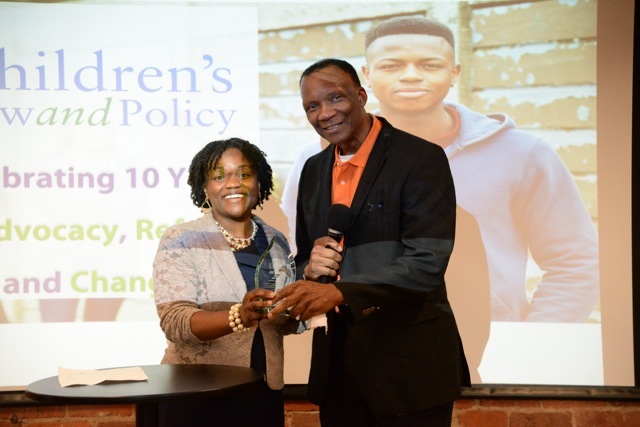 Gainesville Police Chief Tony Jones receiving the first annual ARC (Advocacy, Reform, and Change) award from CCLP on June 9, 2016 in Washington, D.C.
Today, the Center for Children’s Law and Policy (CCLP) begins a nationwide search for four local law enforcement agencies to partner in the Law Enforcement Leadership for Equity Initiative, a new effort to enhance equity and address racial and ethnic disparities in arrest for youth of color. Click here to download the Press Release about the project. The project is funded by a three-year grant from the W.K. Kellogg Foundation of Battle Creek, Michigan. Efforts will help law enforcement agencies to improve fairness of juvenile arrest policies, combat implicit bias, and eliminate unnecessary arrests for youth of color, without jeopardizing public safety. The Initiative will build upon CCLP’s successful prior work with law enforcement agencies throughout the country, such as the Gainesville, Florida Police Department (GPD). CCLP will select four local law enforcement agencies for participation. Each agency will receive intensive technical support for data analysis, policy implementation, and training. Each agency will also receive up to $10,000 to fund improvements that will enhance equity for youth of color and improve law enforcement partnerships with the communities of color they serve. For more information on the Law Enforcement Leadership for Equity Initiative, including eligibility criteria and application instructions, please visit http://www.cclp.org/the-law-enforcement-leadership-for-equity-initiative. All application materials must be submitted by March 21, 2018. About the Center for Children’s Law and Policy. The Center for Children’s Law and Policy is a public interest law and policy organization focused on reform of juvenile justice and other systems that affect troubled and at-risk children, and protection of the rights of children in those systems. CCLP is one of the leading national organizations working to reduce racial and ethnic disparities in juvenile justice. For more information, visit www.cclp.org. About the W.K. Kellogg Foundation. The W.K. Kellogg Foundation (WKKF), founded in 1930 as an independent, private foundation by breakfast cereal pioneer, Will Keith Kellogg, is among the largest philanthropic foundations in the United States. Guided by the belief that all children should have an equal opportunity to thrive, WKKF works with communities to create conditions for vulnerable children so they can realize their full potential in school, work and life.